Chantal Sophia "Tessa" Dahl is a British author. She is the daughter of Welsh-Norwegian author Roald Dahl, and U.S. actress Patricia Neal. Her relationship with actor Julian Holloway produced one daughter, model and author Sophie Dahl. She also married the Businessman James Kelly and had two further children Clover & Luke. She then married again to the Businessman Patrick Donovan and had her last child Ned. 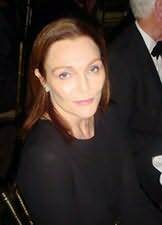 She grew up in Great Missenden, Buckinghamshire and attended Roedean School and Downe House.